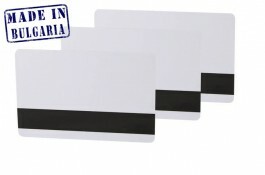 Ultra white plastic card with LoCo magnetic stripe,30 mil. PVC LoCo cards are used in card systems with electronic identification - bank cards, discount cards, bonus cards. White plastic cards with LoCo magnetic stripe carry graphical and electronically readable information, which is recorded on a magnetic stripe.